Boston, MA – December 4, 2018 - Expect Miracles Foundation – Financial Services Against Cancer recognized the significant contributions of Jeff Duckworth, President of U.S. 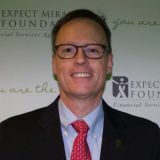 Intermediary Distribution at John Hancock Investments, by naming him the recipient of the Expect Miracles Award. Expect Miracles Foundation rallies the financial services industry to invest in life-saving cancer research and advance patient care programs nationwide. The Foundation’s donor and support base include the top financial firms in the country along with industry leaders. The Expect Miracles Award, the Foundation’s highest recognition given to an individual, recognizes an individual who goes above and beyond to donate or raise significant funds for Expect Miracles Foundation and the fight against cancer. “As a recognized leader in our industry, and a key member of our Board of Directors, Jeff’s professional and personal impact has been tremendous in our ability to help advance cancer research and provide hope to patients,” said Frank Strauss, the Founder and Chairman of Expect Miracles Foundation. Frank Heavey is the Executive Director of Expect Miracles Foundation.